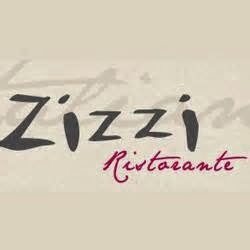 During the New Year my wife and I visited two different Zizzi restaurants for lunch - the first in Gloucester and the second in Nottingham. I suppose that we went the second time because we had such a good experience at the Gloucester edition. However, the two experiences were quite different and not what you would expect from a well known chain of 'fast' Italian food. I say, 'Italian', but they basically serve pizzas and some unadventurous pasta dishes, but after the Christmas festivities when all you have done is cook for others, all you want is some simple good food cooked for you. 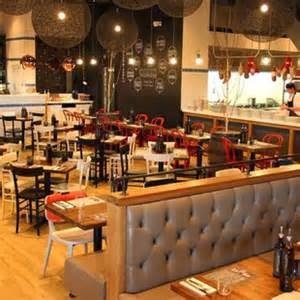 The Gloucester Zizzi is a new branch and situated in the redeveloped dockside Quays area, alongside Italian coffee bars, antique centres and outlet shops. It is contemporary furnished and on one level. There are about 50 covers. What great service we had at Gloucester. The waitress was smiley, friendly and efficient. She deserved the good tip of £4 we gave her. As for the food - we were not disappointed. My wife had a 'skinny' pizza, which is a calorie friendly small thin pizza with a salad alongside (see below). 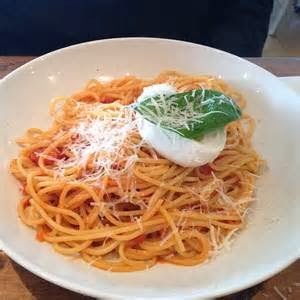 I had spaghetti in a light tomato sauce with buffalo mozzarella. A carafe of Trebbiano white wine accompanied our meal and a bottle of sparking water. This was our first visit to Gloucester Quays and it is recommended as a venue to spend an interesting four hours wandering the outlet shops and the marvellous antique centre. 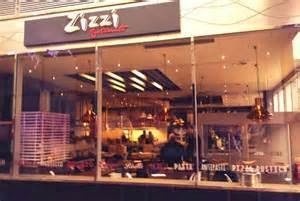 There are all the usual popular restaurants like Pizza Express and Nandos but on this visit our choice of Zizzi was a good one. It has a very modern décor and although the tables for two are quite close together, compared to the 'booth' tables for four and six, I did not find it a problem. The food and drink arrived promptly and tasted fresh and succulent. Although my tomato sauce appeared very thin, the pasta was well coated and the cherry tomatoes were generous and added a tang to the dish. As in all of this type of restaurant, the pasta is not fresh, but dried. I still found it nicely cooked with some 'bite' (see below). My wife's skinny pizza primavera was heavy in roasted vegetables and there was a generous blob of goats cheese. The salad was juicy and crisp. We plan to return to Gloucester in the summer. The bill on this occasion was £31 plus our generous tip. In contrast Nottingham's Kings Street branch has been established for a few years now and my wife and I visited some 18 months ago. So this was our second time here. Luckily for us we arrived at Zizzi in Nottingham for an early weekday lunch and while the upstairs part of restaurant was relatively busy, the downstairs area (below) was empty, so we got served quite promptly. Sadly customers arriving after us had a very long wait for food and drinks as the restaurant was very understaffed. So understaffed, in fact, one of the chefs from the kitchen had to serve customers and even then there was only three of them to take orders, prepare and serve the drinks and serve the food. During our meal, two families walked out as the waiting got so long, while another table of two adults and four children, who arrived at the same time as my wife and I, had only been served with their starters by the time we were leaving after our one course lunch. We could see lots of customers getting impatient. We would have liked a coffee after our meal but realised it would be a long wait. I didn't even bother to ask for our bill, but I went directly to the cash desk and paid there. 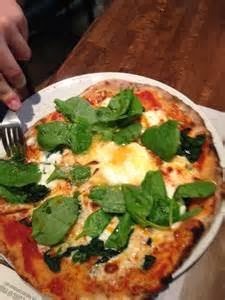 As for our meal, it was what was expected - a tasty classic pizza fiorentina with generous topping and fried egg (see below) and good glass of wine. 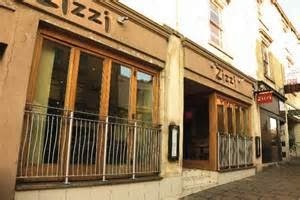 The management need to get their staffing issue sorted and I recommend that future customers to Zizzi Nottingham (below) check on waiting times before sitting down at a table.